It is that time again!! High school graduates are on the way to college. It is not too early to start compiling their supplies. It is not cheap to provide all the tools your high school graduate will need for college. The cost of books along are an eye opening expense. Your high school students may already have an electronic tablet and a desktop computer. It is a great tool to have a computing device that is portable. However the tablet alone can be limiting. It is not always convenient to carry around a laptop. 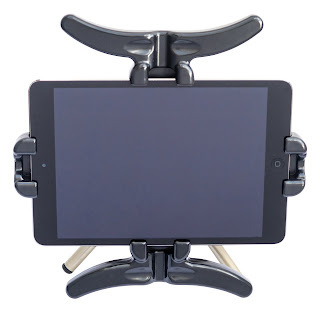 The Pad Go Round is a lightweight adjustable tablet holder that puts two to four handles on most electronic tablets. This versatile tablet holder will allow your student to have portable accessibility to the internet and textbooks. Any electronic tablet can be turned into a small portable computer with a keyboard. There are a number of suitable wireless keyboards to be found on the internet. See how the Pad Go Round can be a valuable tool!